The SKLZ Impact Limited Flight Wiffle Balls. These Limited Flight Wiffle Balls are excellent for all ages, in all leagues. T-ballers all the way to adult leagues, and they love these balls. The SKLZ Limited Flight Wiffle Balls have all the joys of a Wiffle ball without the problems. They are long lasting and stand up so much better than the brittle plastic of their predecessors. They are equal in size and weight but are much more durable. One nice feature is that when they bend with a good hit the ball will pop right back into place without cracking like previous Wiffle balls. These impact balls are perfect for so much more than baseball practice. These SKLZ Limited Flight Wiffle Balls are great for young children; they are easy for them to throw, catch, and carry around. With these balls being such a lightweight product you don’t have to worry about damage inside or outside the house. I have yet to see an Impact ball that survives the number of hits that these balls go through. If you have ever tried some of the other training baseballs out there, you might have found that if you crush the ball (hitting it hard), it stays crushed and does not return to shape. Not the case with these balls!! I have seen light hitters, all the way to ball destroyers take their shot, and yet the SKLZ Limited Flight Wiffle Balls holds up. Compared to the conventional plastic training baseballs, these balls have yet to have a visible dent anywhere. Even trying to break them with my hands, they always spring back out to shape. The proprietary pop-back material, allows them to absorb the impact of the hit and limits the distance they travel. An important feature if your backyard is not all that long and you do not want to chase it in your neighbor’s yard. Incredible impact feedback. Unlike the light impact of the cheaper plastic, these impact baseballs collapsed, creating a more extended period of kinetic transfer from bat to ball, leaving feedback of where and how hard the bat came into contact with the ball, and how much energy transferred. The loudness of the stronger impacts continually put huge smiles on those who know the importance of instant feedback of implications. 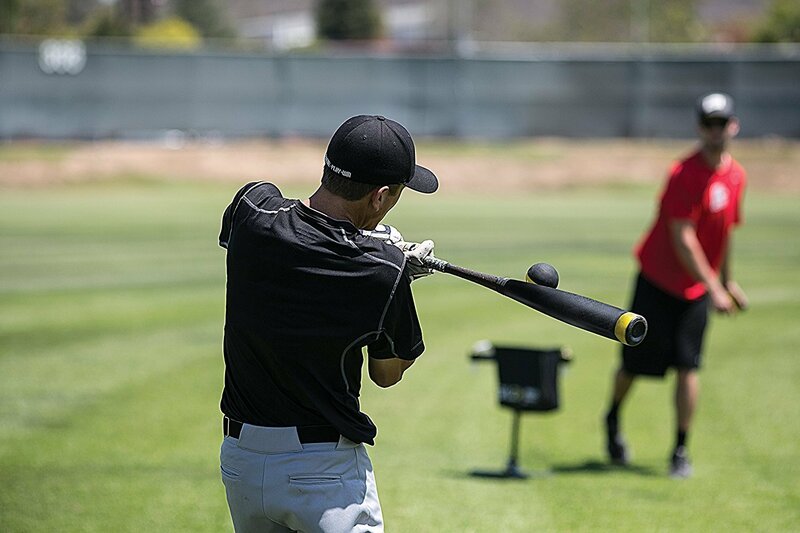 The harder the SKLZ Limited Flight Wiffle Balls hit, the travel distance of the ball will be much less. It was quite impressive to watch the younger players with their lighter bats hit their shots, and launched them over 80ft, while the older kids and adults with more significant, heavier bats delivering more significant impacts, creating thunderous sounds, only manage to about 30ft. So, the stronger you hit, the less you will need to run and collect the balls. We, the coaches that throw batting practice, love the feel of these balls. They’re not so light that it becomes difficult to throw in light wind. With the right amount of speed and the right trajectory, you can be comfortable knowing that your throw will be accurate enough to place them in the strike zone the way you want. Perfect for all pitchers. The size of the ball is just right for practicing hitting a baseball as well. It is even good if you are introducing someone to the game as it provides a proper size object to learn. 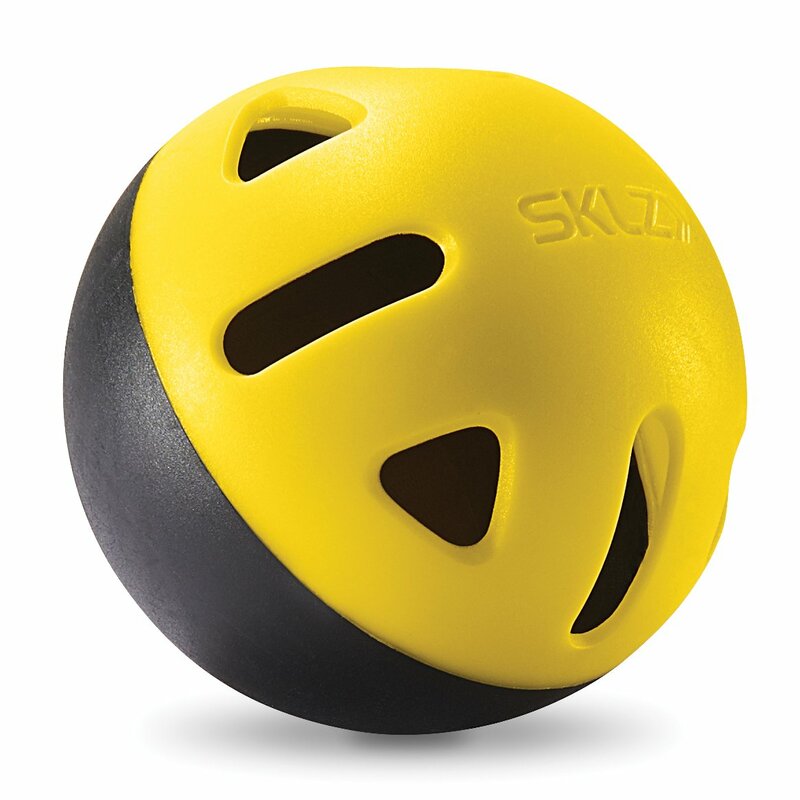 Also, if they strike someone with the ball after hitting it with a bat, the ball will not cause a lot of damage, The SKLZ Limited Flight Wiffle Balls also useful for teaching kids there is nothing to be afraid of the ball when playing catch or catching a fly ball. The color of the ball makes it very easy to see especially on the way you are throwing it. The two colors easily show if the one throwing batting practice has put a spin on the ball or not. It helps the batter to develop a better eye. Forces them to try and pick up the rotation as it is releasing from the pitcher’s hand. Made from a proprietary pop-back material, that can deform and instantly return to shape. No cracking, no dents and will withstand thousands of hits over years of use. LIMITED FLIGHT Wiffle-style BALL – Authentic size and feel, with no need to chase balls. Practice in a yard or limited space without risking damage to property or structures. When the bat connects with the ball – Allows you to feel the sweet spot, allowing you to fine-tune your swing accuracy, speed, and power. Perfect for coaches needing to analyze a players ball contact. Two-tone hemispheres allow the coach or player to see the spin of the ball. Neon color provides higher visual acuity than other two-tone hitting balls. Great for both hitting and pitching. Low impact and less strain on muscles and joints. 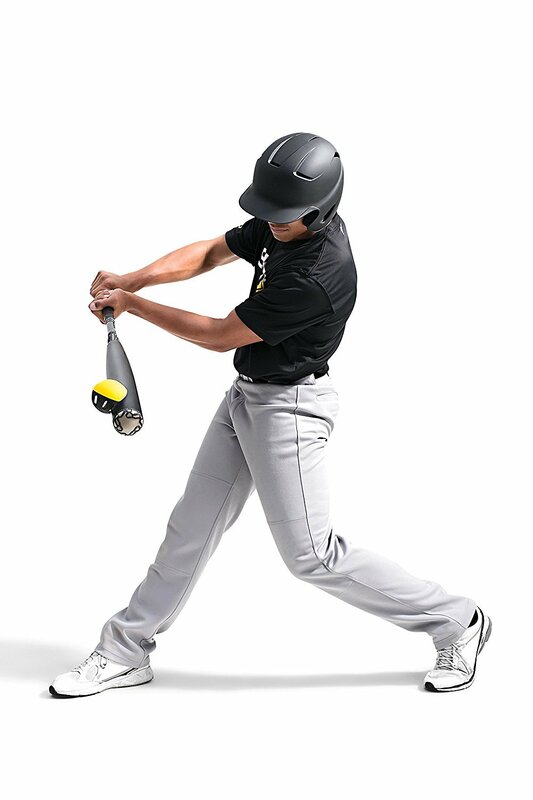 Hit into a net or batting screen or use without, an incredibly versatile tool.